This is the first time I've looked at how my spending by category compares from one year to another. How insightful to look back and see where the money went, but also to see how my spending patterns changed over time. 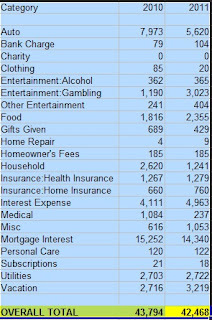 In 2011 my total spending was 3% less than my 2010 spending. When you drill down to individual categories there are some important differences which point to opportunities I see to spend less in 2012. Mortgage interest will drop @ $1,000 due to principal repayment. Interest expense will also drop for the same reason. Two of the larger categories are recreational: vacation and gambling. I plan to spend less on both this year. Spending on food increased by $539 this year. I averaged $6.45/day or $3.23/person in 2011. I spent $1.48/day ($0.74/person) more on food in 2011 versus 2010. Transitioning to a one car family saved us $2,353 in 2011 compared to 2010. Mortgage interest includes interest I pay on investment properties in addition to my home. Most of the Interest Expense category is also related to rental properties. I don't mind expenses which are incurred in the pursuit of higher income. Since the amount I spend on taxes is almost completely out of my control I have chosen to exclude that category. In 2010 I received a very large refund from my 2009 taxes which would skew this report in a way that isn't an apples to apples comparison.